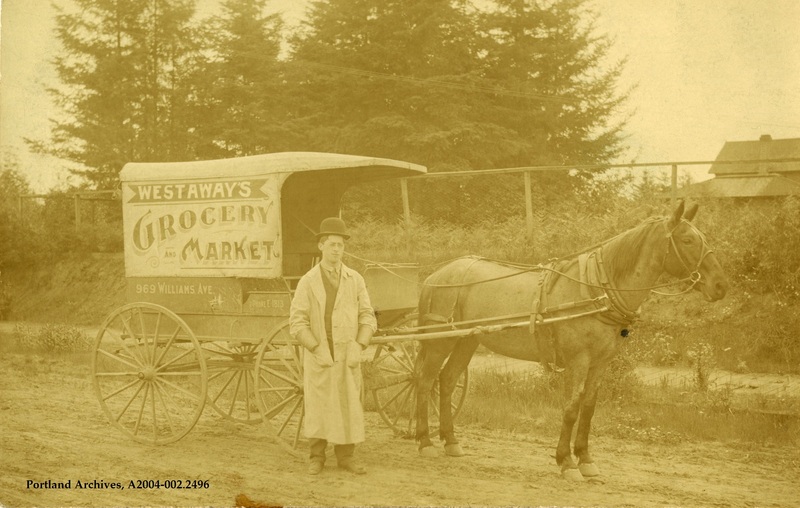 Westaway’s Grocery Market horse and wagon, circa 1909. Mike, I have a copy of a typed-up street conversion, but it’s 243 pages long. Where do you see an address on this entry? I could look it up and report back. Or if you can provide a way for me to email it to you, I’d be glad to do that. 969 Williams Ave is now 4557 N Williams Ave. The J.B. Hoffman Building built in 1903. Probably referring to the address on the side of the wagon. Guessing this address is referring to the location of the market, not where the wagon is located in the picture. Westaway was an old Portland family–they or relatives thereof owned and operated State Laundry and Broadway Dyers and Cleaners at NE Union and Broadway until late ’60s. Guy’s go to the website “Lovejoy Pettygrove” and type in the old address. Dave, this is great! Could there be a link made on the blog for this for all future users? The delivery man appears to be wearing some type of forearm guards. Perhaps to provide extra leverage and to protect his hands while using the reins? Wrist guards certainly and for a curious reason. Men’s ready-made shirts at the time came in one sleeve length…extra extra long. To keep ones cuffs clean and dry men wore sleeve garters at their bicepts to gather up the extra material. The cuff protectors shown go that one better.